Styx is the rock-and-roll equivalent to a Timex watch – the band takes lickings by the critics but, thankfully for their loyal, tour-shirt-wearing fans, the group keeps on ticking. Boasting an annual tour schedule that includes some 150 shows, an itinerary that could be downright brutal for teen-aged musicians, Styx is one of the busiest rock bands one will find, and the group’s popular cuts like “Come Sail Away,” “Renegade,” “Blue Collar Man (Long Nights),” “Fooling Yourself (The Angry Young Man)” and “Lady” still attract the ears and boost the heart rates for seemingly countless listeners of all ages. 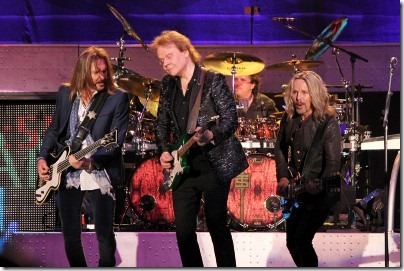 One doubting Styx’s place in pop culture need only to have attended the quintet’s gig on Sept. 1 at the Walmart AMP in Rogers, Ark., to see and hear that Styx, for many music-loving individuals, still matters big-time. Hipsters might continue to lean to all things they’re instructed to admire, but the Styx fans on that cool, breezy evening at the outdoor Rogers venue want their Styx songs loud and oozing with energy. And that’s just how Styx’s songs sounded on that stage. Guitarists-singers Tommy Shaw and James “JY” Young pulled complex patterns and textures of multiple tones from their guitars, performing as well as they did during Styx’s “The Grand Illusion/Pieces of Eight/Paradise Theater” height of the late 1970s and early 1980s. The passing of time repeatedly has failed to slow down the fingers and brain power of Shaw and Young. It was absolutely stunning how the duo’s guitar interplay continually impressed throughout the two-hour set, which featured the aforementioned songs, as well as “Miss America,” “Man in the Wilderness” and possibly the greatest – and grittiest – in-concert version of “Crystal Ball” witnessed by this writer. Sometimes compared favorably to Queen’s knack for multi-voice parts, Styx’s vocal harmonies were as riveting as the instrumental work in Rogers. 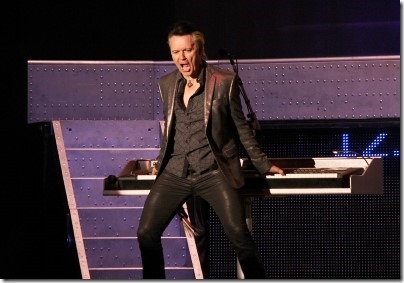 Singer-keyboardist Lawrence Gowan, a member of Styx since late 1999, sang with fierce conviction, as did Shaw (and Young when he sang lead on “Miss America”). Bassist Ricky Phillips, a former member of The Babys, Bad English and Coverdale/Page, worked his 5-string basses with the ease of a pro, and at times, he added a crucial fourth voice into the microphone to help stack Styx’s vocal mountain higher. Manning the drum kit, Todd Sucherman served a jaw-dropping effort. Sucherman is incredibly technical, but he also keeps his mental focus on taste. His drumming flowed without ever distracting from the songs. Quick tom rolls here and punchy cymbal strikes there formed Styx’s sonic foundation to perfection. There wasn’t a single drum sound out of place, and the same can be said of the guitar, bass and keyboard lines from Sucherman’s colleagues. A now-departed friend once told me bands like Styx and Bad Company “hadn’t had a Top 40 hit single in ages.” But really, in the grand scheme of life, does it really matter when X band entered a certain musical chart or sold X amount of records? If a song moves an individual, even though it was released 20, 30 or 40 years ago, that’s all the matters. More fans might have danced to “Renegade” at Styx’s Rogers concert, but when Styx performed “Come Sail Away,” I stood frozen, unable to move but still capable of grinning while watching the stage. And when Gowan sang the song’s second verse – “I look to the sea, reflections in my waves spark my memory/Some happy, some sad/I think of childhood friends and the dreams we had/We live happily forever, or so the story goes/But somehow we missed out, on that pot of gold/But we’ll try the best that we can, to carry on.” – every hair on both of my arms stood up at attention to greet the cool breeze. The live reading of “Come Sail Away,” like the excellent studio original version from 1977, took me back to my elementary-school youth, where “Star Wars” trading card, Little League games and my parents’ “The Grand Illusion” 8-track cassette offered so much joy and peace in a slow-turning world that had yet to be bruised by daily school shootings, terrorist attacks and politicians deemed untrustworthy by 60 percent of the voting population. Like the scene in “Batman V Superman: Dawn of Justice” when the photograph of Kevin Costner is carefully placed inside the open casket, “Come Sail Away,” when played in Rogers, lodged a lump in my throat and sprinkled a slight mist in my eyes. This time, I couldn’t blame it on popcorn salt, as I do in movie theaters. The song has a magical – and rare – way of completely freezing time. The second that beautiful piano intro is heard, it nudges me into an almost trance-like state. Yep, “Come Sail Away” gets me. Every. Single. Time.